iBikeuBike | If I can bike… So can you! My spectacular son never ceases to amaze me. 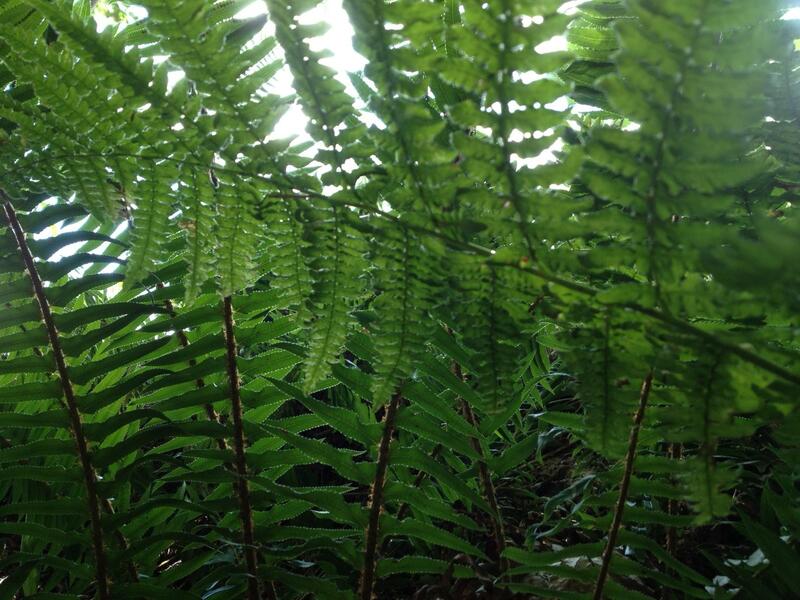 Check out his newest posting The Annona Files. Leg warmers are the secret ingredient to my biking wardrobe that laughs at freezing temperatures, and yet allows me to pedal freely under my rain/mud pants. I rarely venture out without them. Grown up since their 80’s Flashdance roots, fluorescent pink giving way to mellow earth-toned leg warmers and interesting textures and fibers. Coupled with wool socks my feet and ankles want for nothing, even while pedaling me through freezing rain. As a family, our rule of thumb is “nothing new” which usually means buying used, but in this case it meant repurposing a thrifted wool sweater vest. 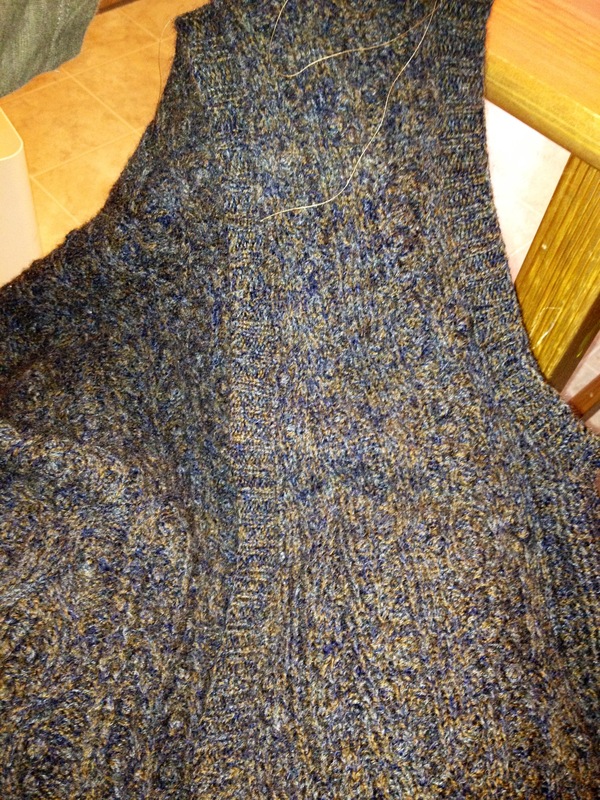 I love the nubby texture of the fabric, the brown has little blue highlights in it. I prefer 100% wool, natural fiber over synthetic, but I HATE factory farming… so buying used removes the animal-product guilt from my conscious. The vest cost me less than a dollar. Homey covered buttons on the sweater worked great for trimming the leg warmers. Supplies: Old sweater or sweatshirt. Fleece and wool work well. 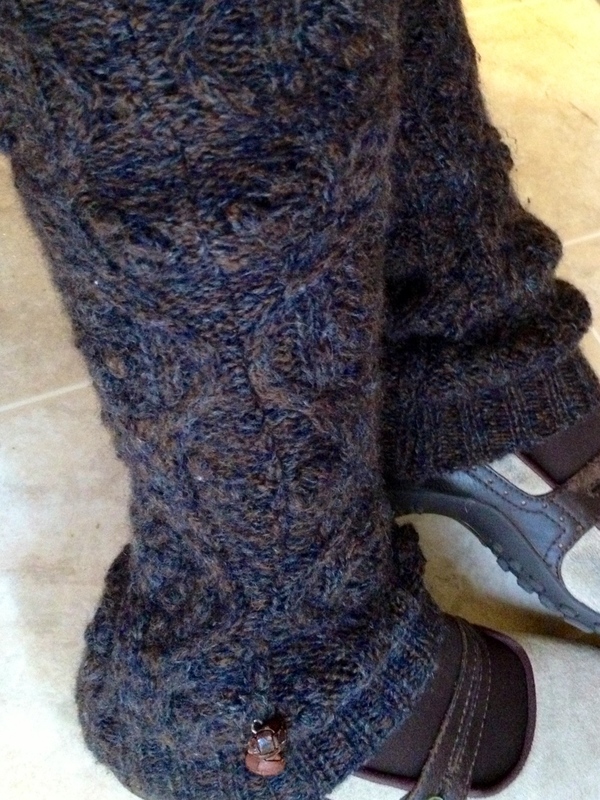 Measure: Hold the sweater up to your leg, with the waist ribbing at your ankle. I like mine to cover the top of my shoe and stretch over my heel in length and either thigh high or calf high depending on how much fabric I have. Wherever it reaches, measure your leg’s girth. 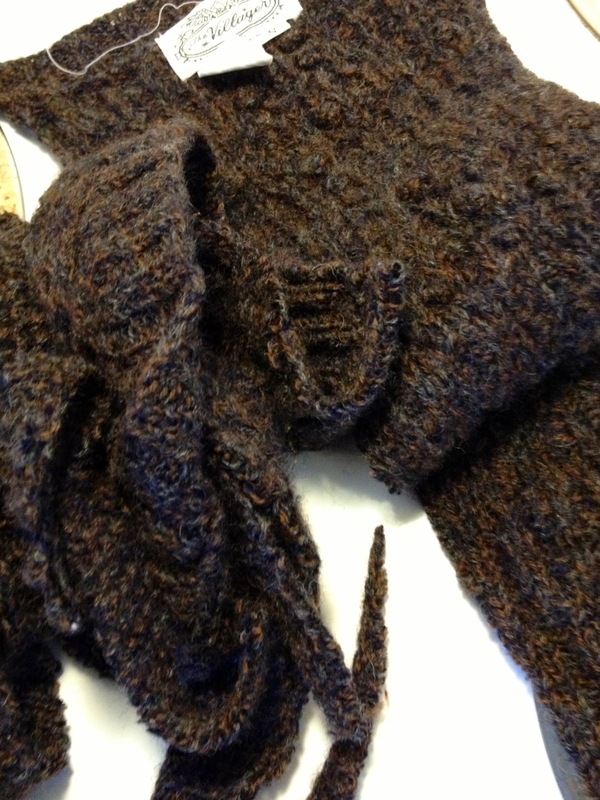 Make the Tube: Turn the sweater inside out, keeping the right sides together. Match the ribbings at the bottom and stitch up from the bottom closing off the arm holes. Use 1/2 your leg measurement plus two inches for seam allowance and ease to measure the top width. Pin or chalk a line down to the ankle. You can either taper slightly if you want them fitted at the ankle or flare for a more generous fit. Match the ribbed edge again and stitch. Stay stitch along the cut edges to prevent unravelling. I zig zag, but if you have an overlock machine that would be awesome. If hand stitching, whip stitch around the edges. (If you are using fleece skip this step as you will not have any unravelling issues). 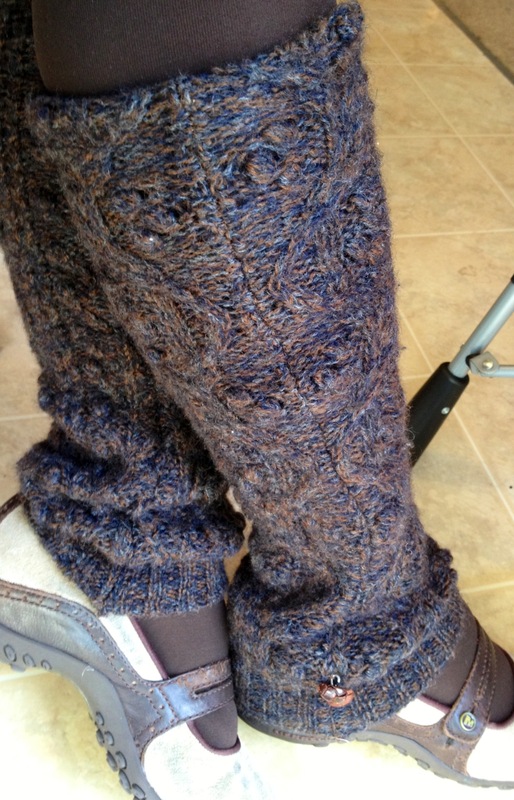 Finishing: Turn the leg warmers right side out and try on. Depending on the weave and fit you may need to turn the top edge over 1″ to the inside and topstitch 3/4″ from the fold to make a casing for an elastic band. Leave a 2″ opening to insert the elastic (thread thru with a safety pin). 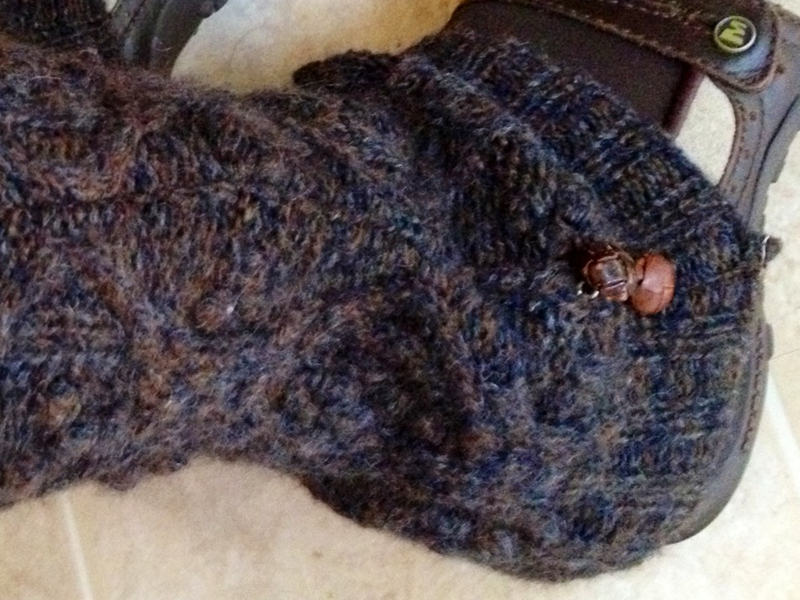 Try the leg warmer on again and adjust the fit and elastic length as needed. Stitch the elastic ends together and stitch the casing closed. I skipped the elastic step and just hemmed the edge as mine were snug and stretchy enough to stay up on their own but have another pair that are loose enough that renders the elastic vital. Trim: I stitched the little buttons on at the ankle but there is really no end to the ways you can embellish; embroidered whimsy and crochet trim are both on my to-do list. If you wanted extra warm you could line with flannel or fleece – just allow for extra bulk when you measure and cut. So there you have it! If you make these please let me know, comment and share! If you have any other great ideas for keeping warm on the bike or cutting up old stuff and making it new, please comment below and let me know! 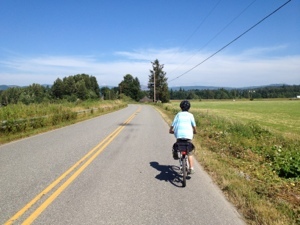 About Biking: in which our 12 year old son serves up fresh car free perspective. I know I will never buy a car, and I don’t know why anyone would. So many children and teens ride bikes. I would think that after that biking experience they would not want to be constrained in expensive metal boxes. There are so many pedal-powered options, such as bicycles, tricycles, tandems and surrys. There are even pedal-boats and pedal-planes! I seem to remember every ride, short and long. Each ride has something memorable. Once, on our way to a berry farm, over the highway, my tire started to go flat. In the boiling heat, my mother and I quickly rode to the farm, along side which my mother changed her first flat tire. Unfortunately, by the time she was done, the farm was closed, and we had to go back home. Another time, during the cooler days, we biked the five miles to our favorite grocery store. 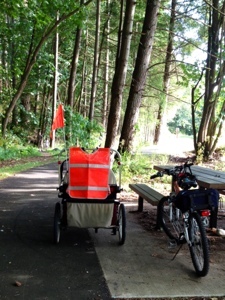 We took a test ride on an unpaved trail, which took us two miles out of our way. It turns out that two miles is a long way, when the sunny sky bursts into tears and soaks through your “waterproof” rain jacket. The bags on the back of our bikes, which we had sprayed with a waterproofer, proved unreliable and filled with water. But still, bicycle riding, I think, is one of my favorite things in the world to do, especially before bed. There are so many reasons, biking is healthy for the environment, healthy for me, if I can bike, really, so can you. Many moons ago, before The Wiggles and Yo Gabba Gabba became the mainstays of my family’s playlist, Public Radio was our go-to station for diverse, thought provoking and often humorous programming. 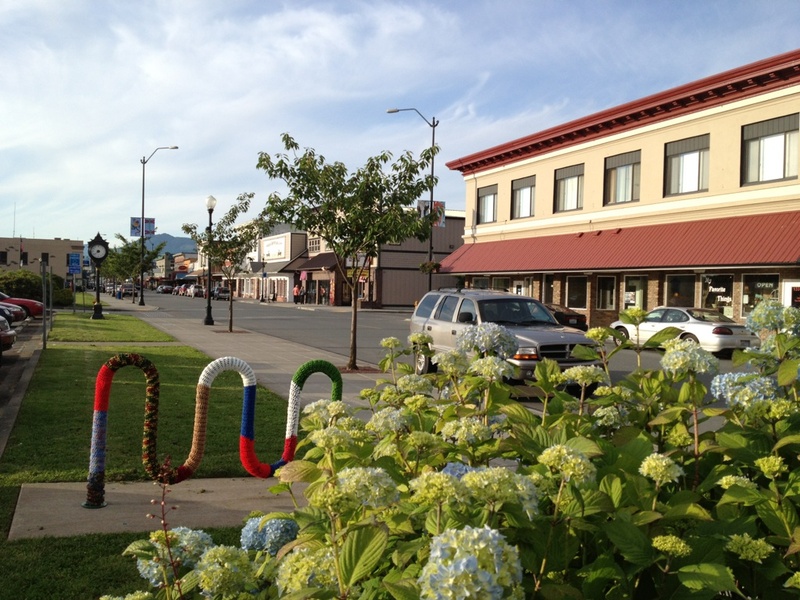 Oregon Public Radio show Think Out Loud ran a show last month about biking in non-urban areas. City cyclists receive much attention in terms of safety, infrastructure and funding but developing safe roads for cyclists in non-urban areas is a relatively novel concept. 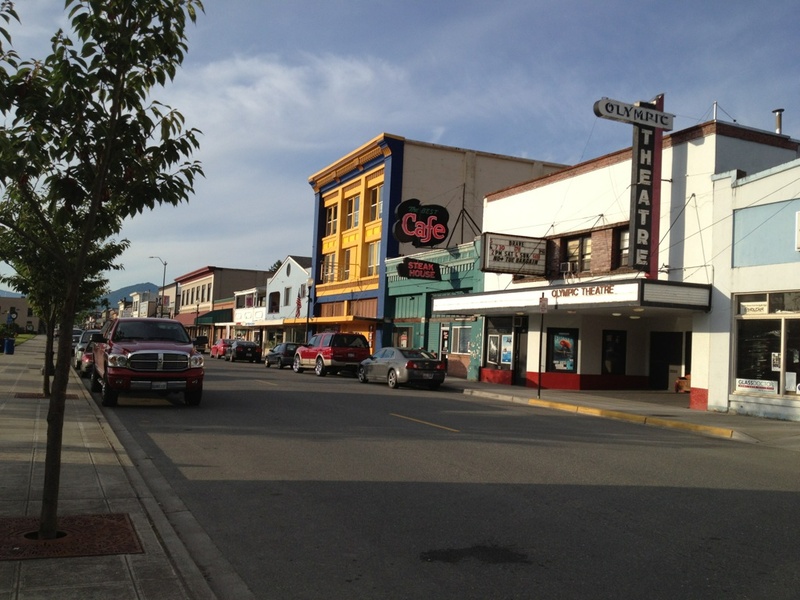 TOL asked me a few questions about our experience competing for road space in rural washington. You can check out the entire broadcast here. My segment only lasted a couple of minutes but it was a fun to touch on these issues from a family perspective. Recording the broadcast itself was exciting. My twelve year old son had babysitting duty while I ran to the garage for quiet. Live radio doesn’t yield much forgiveness for a wailing “Momeeeeeeee”. Worrying about the children interrupting or burning down the house did wonders for my nerves, in general, as I didn’t really have much time to worry about what I was going to say. As short as my segment was it got me thinking about family biking, the concept of the weakest link and grassroots advocacy. For us, as a car-free family biking is much more than recreation or a hobby. It’s about function and practicality. Getting groceries, getting to school and meeting our transportation needs without turning a key. As a result we are exposed, to the elements, the public and most critically to a constant stream of 2,000 plus pound vehicles zooming by next to our children. Our town has a lovely multi-use trail for recreation however there is no infrastructure to connect us to stores and services. As a result we are forced on sidewalks, across grassy/ muddy areas where there is no shoulder and in some places into the streets. The idea of building streets and communities to service pedestrians and cyclists seems like a no-brainer. A hundred years ago the auto was viewed as a dangerous intruder to streets in which pedestrians, bikes, women, men, children were the dominant force. In our “modern” culture cyclists and pedestrians are fighting for safe ways to commute. While I believe cycling to be one of the safest and most affordable means of transportation; we bike defensively. With my twelve year old on two wheels and five year old and one year sheltered only by a fabric and aluminum frame trailer it’s not enough to assume a motorist will stop or check the bike lane before turning. I take full responsibility for the failure of motorists to stop, yield or give enough room. I have to assume that every car is playing a deadly game of Russian roulette and keep the barrel aimed away from my family. Buffered bike lanes and infrastructure certainly offer some measure of protection but they must be built with the smallest, or most vulnerable user in mind. The wheelchair, the stroller, the child are the weakest links. If our streets fail them. They have failed entirely. One casualty is too many. I believe the path to change is going to be cut by a change in consciousness. It was not until my family got on bikes that my scope of vision widened. Now I notice cyclists and pedestrians. I pay attention to legislation and bicycle advocacy. I seek opportunities to encourage and educate everyone and anyone about the freedom and possibilities that using a bike as transportation offers. There is no overestimating the strength of families, mothers and fathers for providing and protecting their children. As more families and individuals experience the myriad of wonderful benefits of biking, their consciousness will expand too. Collectively we can raise awareness, be a force for change and build a better future. What do you think? How can cyclists and family cyclists protect themselves? What are the solutions to keeping families and individuals safe while commuting? Are cities inherently more safe because of biking infrastructure ie: bike lanes, sharrows etc? 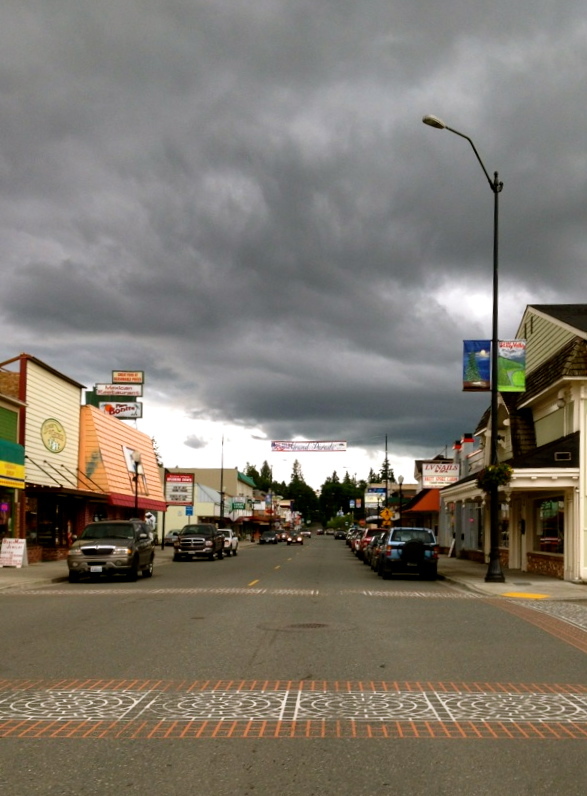 Dark clouds loom over our small town. The pounding on the door shook the house. Our next-door neighbor appeared at our door, sweating and frantic. Had we seen his daughter? Maybe she had come to play with ours? His faced twisted in agony as it registered that she wasn’t at our house. My husband and he hurried outside as a trio of police cars, sirens blaring, converged on our street. I gathered that Dad had fallen asleep on couch watching a movie with his six-year-old daughter. When he woke up, she was gone. Strapping my one year old to my back, I grabbed my other two children and hurried out the door. Out of doors our small town suddenly looked vast and unsecured. Fence-less yards connect alleyways and streets; she could have gone any direction. Methodically I began to canvass the neighborhood, knocking on doors and stopping bewildered passersby. Choking back dread, the lump in my throat made it hard to breathe. I remembered hearing that each minute a child is missing, the chances for recovery plummet. Looking at my phone for the fiftieth time, hoping for an update, when it actually rang I dropped it. It was my husband. FOUND! Tears sprang from my eyes as a wave of relief flooded over me. She had been sleeping underneath the bed, just out of sight, a heavy sleeper she woke bewildered and confused. My children and I shared hugs and laughter as we retraced our steps, sharing the good news with those who had joined the search. As we approached each one, their faces, creased in concern, broke into smiles of relief. I couldn’t believe so many people had mobilized and formed an impromptu search party! We stopped to thank and reassure each one. The Hardware store that had broadcast over walkie-talkies, the mother at the park that had scooped up her infant and searched, the art gallery owner who left her shop to search the park; the smoke shop ladies who had stopped pedestrians on the street as well as many customers and others. The caring and overwhelming concern was deeply moving. Trekking up the hill to our house the adrenaline finally receded. I couldn’t help feeling a pride in the bonds that we, as a family, have unwittingly forged with our car-free, lifestyle. We are a novelty of sorts, the family waiting in the rain at the bus stop in front of city hall, or walking our, frequenting local businesses and picking through our small farmers market. Outside the confines of a car even a trip to the grocery store we look more like a traveling circus than a family on bikes. We get waves and smiles from those we meet, turning strangers into familiar faces. We used to live in a small, rural farming town. We now live in a caring community. A community that turned “the worst thing” of a would be tragedy into a great day, a victory. What do you think? 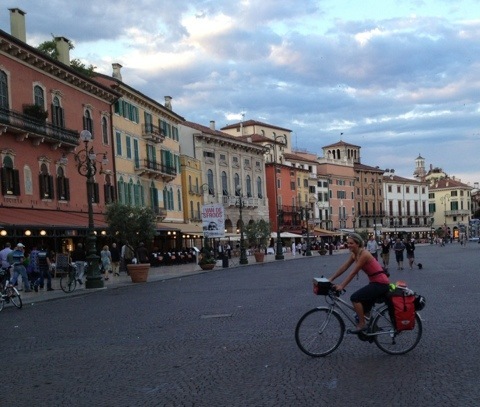 Does the walking; biking, the car-light, car-free lifestyle strengthens physical communities? What’s your experience? How can you join in the revolution? Revolution. The word itself elicits an emotional response. Change, unease, fear, excitement – and maybe hope – all conjure up expectations for the future. The Latin root of revolution means to turn; to turn back. This is my revolution. I was five when I got my first serious bike. 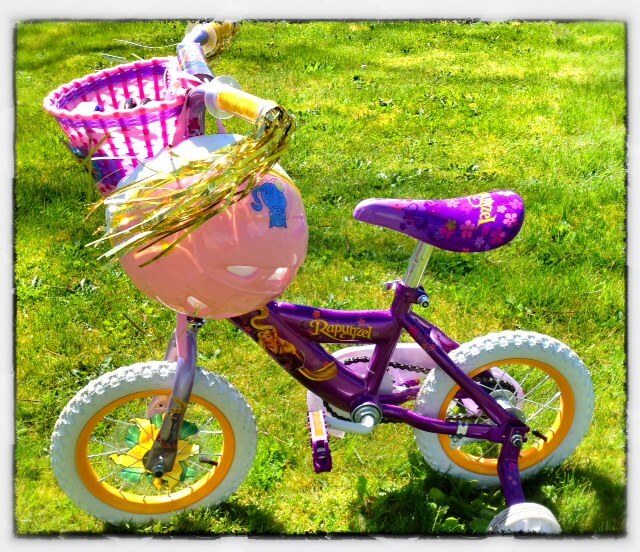 By serious, I mean without training wheels, but with glitter streamers exploding out the end of the handgrips, a white basket securely fastened to the handlebars, and best of all, a banana seat. Ohhh yeah. Living smack-dab in the middle of the city, the 70’s-style bubble font on my bike proclaimed I was now a “Country Girl.” It was my bike, and the love I felt for it was not dampened by the fact I didn’t know how to ride a two wheeler. 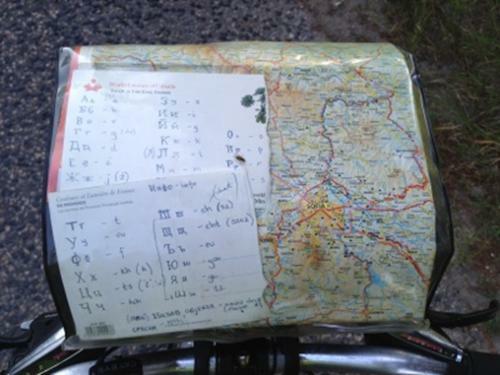 My brother, three years older and infinitely wiser, saw to my bikeducation. The first time around the block, he ran beside me, holding onto the seat while I wobbled and shook on two wheels. The second time around he let go, bit by bit. Each time, I would get stuck, until he push-started me again. I remember looking down at my pedals, frustrated. My brother pushed a pedal to the top of the sprocket and told me to start from that position. I pushed down. The magic happened, and I was pedaling. The third time around that block he just ran along beside me as I pedaled, both of us grinning like Cheshire cats. My heart felt like it would burst with pride. My bike represented independence and freedom in my young life. We rode through the Arizona heat to cool off at the public pool; we shunned the bus to ride to school; we got out of school to bike to orthodontist appointments; we escaped to the movie theater on our bikes. At sixteen, I hung up my bike for a set of four wheels, only to get back on my bike, after a serious car crash left me too shaken to drive. But the complexity of the rat race captured me with a new job, a new house and a new car in the driveway, my bike was demoted from transportation to recreation. I sold it at a yard sale. I can’t remember when or why. Maybe I had grown up. And then last year, it happened. Strolling through the local department store we turned down the bike isle. A quick look at the members of my family, five strong, and back at the bikes and there was a glimmer there, a playfulness waiting to be explored. These were the value-version of the better bikes sold in bike stores. But for the price of one good bike, we outfitted everyone in our family with a set of two wheels. Not only did I have my own bike to love, so did my husband, my eleven year old and four year old. The baby got a double bike trailer that would also serve as a sag wagon for the four year old. We figured if we “stuck with it” we could always upgrade later. Sometimes I feel it: that uneasiness that “revolution” conjures up… but mostly I feel excitement and hope, fresh possibilities. I relish that our wee family is a band of rebels, joined together on this car-free adventure. Each time I set one pedal to the top, I turn back to simpler times. I feel that Cheshire cat grin growing on my face and familiar tightness in my chest when I see my five year old pedaling wildly around the block. Maybe she won’t grow up so fast; maybe…I didn’t after all. I figure I’ve spent most of my life in a box. Boxed up in a house, in a school, in an office, in a store or in the glass, plastic and metal confines of a car; it’s all box time. The transition to car-free living is like being mounted on a spring and catapulted out of the box. Every day, whether on foot or on our bikes we must venture out. The days of vacantly transferring our corpse-like bodies from work to school, to car to garage, to box to box are gone. The morning was rough as the pothole, pocked and cracked roads we ride. My three children were in rare form, being both rambunctious and as slow as molasses on a cold day. Getting them out the door I assumed my usual role as the octopus drill sergeant, juggling backpacks, rain jackets, lunchboxes and children while barking orders to the troops. The barometer was pitted against me; the forecast: cold, wet and windy. My shoulders constricted up to my ears, the tension settling into my face, to call me dour would be a loving compliment. I get the two little ones buckled in the bike trailer and my oldest I take to our bikes and pedal out. Outside. The magic begins before the garage door has creaked closed. My breathing syncs to the rhythm of bike as the furrows in my brow soften. For the first time in the day, I feel aware. 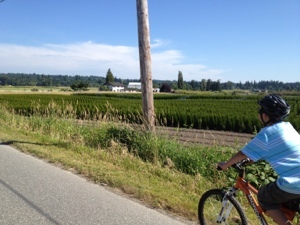 My eleven-year-old son pedals beside me; his cheeks glow rosy from the cold and exertion of the ride. I can’t believe the change in 5 months, transforming him from sluggish and soft to this young man before me. He is strong and lean, confident on his bike. Outside we are equals. Bicyclists. Usually shy, my five-year-old is singing at the top of her lungs. Outside she is free of inhibition, a happy bird singing her morning song. Her one-year-old brother is nestled beside her. Outside he is content and relaxed. “Content” is an achievement for this non-stop powerhouse. The streets are quiet; a few poor souls putter by at 35 mph locked inside their boxes. I pity them. Their faces are dour and their shoulders hunched around their ears like mine were in the box. They haven’t had the chance to be outside. We stop short as one wheels in front of us, brushing her teeth furiously, while texting on her cell phone. My son lets out a guffaw. She never even noticed us. Most of them don’t. “We wouldn’t have seen (fill in the blank) if we had been driving.” Has become my children’s favorite saying. 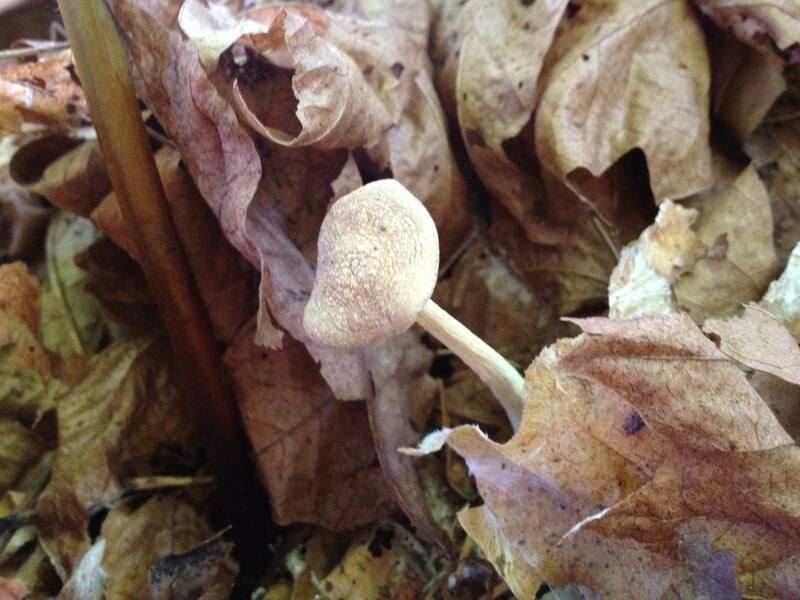 Today it was the circle of Morel mushrooms the oldest spotted by the schoolyard. 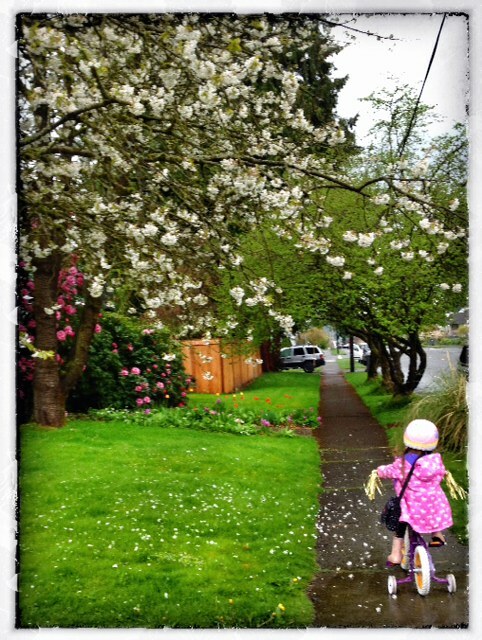 My five-year-old wonders out loud who planted the hundreds of blossoming cherry, apple and dogwood trees? She says they surely weren’t here last year. At least we didn’t notice them from inside our boxes. What else did we miss while doing box time? Pushing through the perceptual barrier of convenience and comfort has driven home the adage “out of the box”, and this Jack-is-not-going-back-in-the-box. Venture out of the box and tell us about it! Join the revolution! Why are you riding your bicycles? Why do you ride your bicycle? Leave a comment, your blog or website and share your experience.